Prior to Musk's speech, SpaceX unveiled the Interplanetary Transport System, or the spaceship that will transport humans to Mars. A video simulation reveals details of the system, which include a reusable booster rocket that returns to Earth before heading back into orbit to refuel the spaceship. 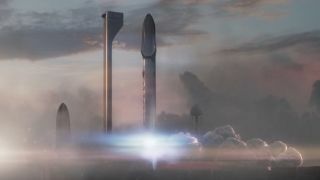 Musk also tweeted some key points about the Interplanetary Transport System, namely that the rocket booster has a 12m diameter, the spaceship a 17m diameter, and the whole stack has a height of 122m. The Falcon 9 rocket, for comparison, reaches a height of 70m on the launch pad. Elon Musk is nothing if not extraordinarily ambitious, and today the Tesla and SpaceX CEO is set to reveal key parts of perhaps his grandest scheme to date: how he wants to colonize Mars for humans. In an hour-long presentation from the International Astronautical Congress in Guadalajara, Mexico, Musk will outline the long-term technical challenges that must be solved in order to support "the creation of a permanent, self-sustaining human presence on Mars." Musk wants to send a rocket to Mars in 2018 and have humans on the Red Planet by 2024, so the clock is ticking. Earlier this week, Musk announced tests of the Raptor rockets that will propel a vessel to Mars are under way, which is a good sign of progress. Today, he'll present potential architectural options that could sustain human life on Mars in a bid to garner support (primarily, financial) from various parties, including NASA. The presentation, then, is more a chance for Musk to prove he's not just blowing smoke to the people and institutions that might truly make humans a multiplanetary species. It's still worth tuning in if you're intrigued by Musk's mad plans, or if you're interested yourself in one day traveling into space or beyond. With space tourism furnished by private companies gaining ground, it's not too far fetched to think that in a few years' time, we'll all have the chance to travel to the stars. The presentation begins at 11:30am PT/2:30pm ET/7:30pm BST/4:30am Wednesday morning in Australia. You can follow along by watching the live stream above, or by flipping over to spacex.com/Mars.